Rosedale EMT Leah Littlefied received a scholarship from the Baltimore County Volunteer Firemens’ Association. 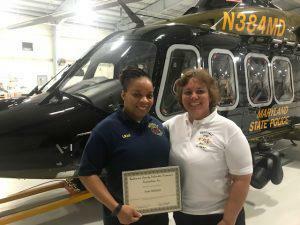 The award was presented at the May association meeting held at the MD State Police Aviation Hanger, home of Trooper 1, which provides air medical care for the region. Scholarship opportunities are one of the many benefits available when you become a volunteer firefighter or EMT. Congratulations Leah !